Beginning can be so hard. It can be so overwhelming. It can even be frightening. It’s not hard to come up with a million reasons NOT to start. There are always other things. It might not work. Other people are better at this. It takes too much time. Nobody will be interested. Who am I anyway? Who am I anyway? I think this last question is kind of the key. When we start our project, start to share our ideas or our vision in tangible forms, we find out who we are. We dig through a facade, we strip away the unessential, we create a new story based on reality not imagination or perception but only if we begin and begin and then continue to continuously begin. The habit of starting is so important because great work, important work, meaningful work has to be continuously started: everyday, after lunch, in the evening, the next day, the next week, the next month, the next year. Over and over we need to begin. We need to sit down and pick up where we left off. Each time we sit down to do our important work, it’s a new beginning filled with new possibility to dig deeper, or reach farther or where we’ve never gone before. If we can just start and somehow manage to continue to start again and again magic can happen. And if you’ve already began, continue to begin. 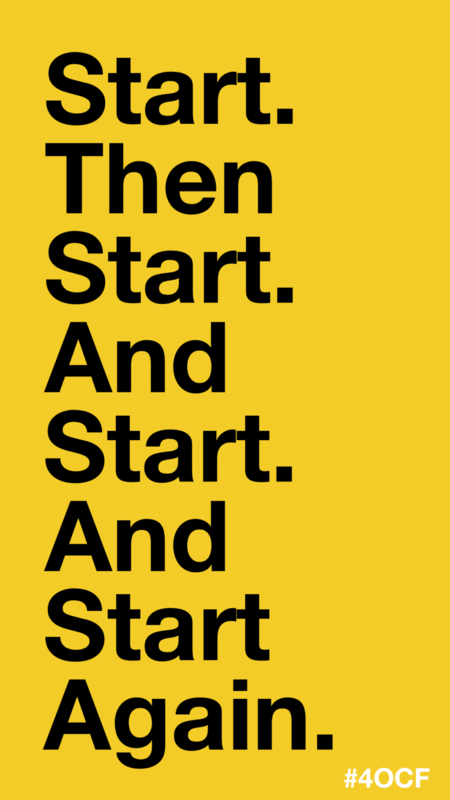 May your starts never end.